Golden Terracotta Silk Scarf. Antique Green Hand Painted Silk Shawl. Silk Scarf GOLDEN DAYS. Large 14x72. Birthday Gift. Gift-Wrapped. This is a 100% Habotai silk scarf featuring alternating segments in golden terracotta and antique green, separated by thin section in chocolate brown, featuring a filigree-like pattern in brass. 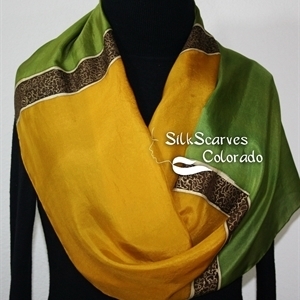 This is a very elegant scarf that would make a perfect accessory to a more formal outfit. SIZE: This is a LARGE scarf, allowing more generous wrapping - size: 14" x 72" (35 cm x 183 cm).